The board seemed strangely quiet so I thought I would incite the Repubs and rally the Dems. So go for it! And to me that makes him the greatest president ever. 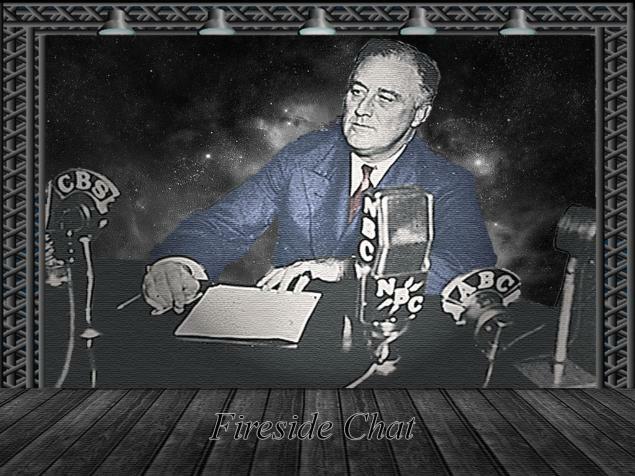 According to 17 authorities ranging from historians to the newspapers, including the Wall Street Journal, the aggregate, I repeat, the aggregate rank for FDR is ...... #2. Even the Wall Street Journal ranks him as #3. No doubt. My grandparents and their generation knew it well. The New Deal was a VERY BIG DEAL in terms of Social Justice. As Michael Lerner never tires of saying, we need a new New Deal! The mediocrity of most of our presidents shows that there is definitely something wrong with our political system. That's why I would like to see the 2012 elections postponed and a nation-wide referendum held instead, in order to RETHINK AND REVAMP our political system. If we are to survive as a nation, we'll have to find a way to select better leaders! Happy Hanukah, Winter Solstice, Christmas Eve New Moon, Christmas and welcoming in the long-awaited 2012 year of transformation. Good Cheer, Love and Light!!! One of the greatest Presidents in our history. A true representative and a true leader. He's a politician, that makes him both saint and sinner. He used an economic disaster to gain office. Made some good attempts to improve things. Made some errors and may have unintentionally prolonged the Great Depression. Started us on the road to an entitled society, but at the time he made sure we could pay for what got. Growth was up and unemployment was down under FDR every year he was in office but one. He didn't prolong the Great Depression. I've heard that claim many times. It has been spread by die hard conservative partisan puppets. There is only one place in the universe where a 'quick' recovery from a severe economic depression is possible. That place is Fantasy Land. I'm only referring to a recent theory by a couple of scholars, and I did preface it by saying he may have. He started a move of government being more active in our lives, I'm not sure that was good, but we're on it now and people don't seem to seriously wish to change. I just don't see him as either extreme. It's not specifically his fault we failed to adjust Social Security as life expectancy went up, or to fund it better. Its also not his fault that so many producers and providers of energy, food, health care, and financial services became obsessed with maximum profit driving up the cost of living and the need for adjustments to social security. Longer life span too. It was never set up to pay out for over a decade and a half on average for each person. Health care has improved, the new technology is more expensive. I don't blame anyone, politicians only solve problem for the short run. That's one of their failings. Roosevelt began the pattern of people looking to government to solve all their problems. Some of it has turned out well, some of it not so much. A safety net for those with legitimate need is not only morally responsible. Its absolutely necessary. There would be mass chaos without it. Obscene charges and aggressive marketing tactics ultimately increase the need for that safety net. You have to look at both sides of the equation. I have no problem with social plans or spending for those in need. My complaint has always been directed against government for allowing people to think things from the government are "free". Then the situation is made worse by not taxing enough and then inciting economic class warfare. Everyone needs to pay higher taxes to do what we want government to do. Did some bad and good. So mediocre president at best. 1-Trap American people into believing that Democracy is a system of minimal financial security after you are potentially useless to a workforce as a participant of democracy. In essence this statement demonstrates a fallacy not only of belief (in democracy) but participation as well because it is not only partial but also its partiality is designed to gain more social and political advantage for the Rich (economy) and Zionists (politics) than the poor as we can see it to be unfolding today. So my opinion in this regard is that FDR was a stupid clown because there are social systems in force today in other countries that work much better and they are not restricted or regulated by age,disability, and poverty. 2-Everyone now knows that the New Deal was designed mainly to put a damper on ever growing early 20th century Communist sentiment across the globe. This also proves how scared of Communism FDR and those who supported him were that they scrambled to come up with some idea to change people's attitudes especially the skeptics and intellectuals towards politics and economy in US. It was at best a temporary solution portrayed to be permanent because the idea behind the New Deal is contrary to economic and political realities in United States.